Unlike other cooling solutions that require extensive and expensive installation, Uptime Racks MRCS13 & ECC13 are very simple and cost effective to install. The plug-and-play design reduces the time and costs needed to cool down servers located in the data center. Total installation time varies , but typical installation takes approximately 20 – 30 minutes. The casters allows the cabinet to conveniently roll into tight spaces and from room to room, or moves with the tenant at the end of a lease. Three main items need to be address during the installation: power, exhaust air, and condensation. No special electrical wiring is required since all Uptime Racks operate on a standard 115 VAC power source. Both the MRCS13 & ECC13 require a dedicated electrical circuit for their air conditioner. When the Uptime Racks are installed in a small enclosed environment (i.e. computer room, office, etc…), the warm exhaust air will need to be removed from the room. This is done by ducting the warm air up into the drop ceiling above the room. 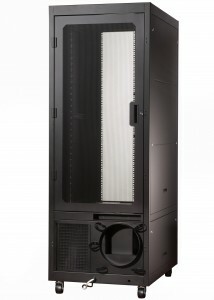 If the air conditioned computer cabinet is located within a data center that utilizes a cold aisle / hot aisle layout, the MRCS13 & ECC13 have the option of ducting the warm air up into the ceiling plenum or directly into the hot aisle without ducting. A condensate pump is a valuable feature that allows the MRCS13 & ECC13 air conditioned computer cabinets to operate continuously without monitoring. The pump is located in the bottom of the cabinet, and the discharge vinyl tubing is routed out the back of the cabinet to a nearby sink, drain, or water line.